Dr. John has been in a rich vein of form in the last few years and his previous release for Nonesuch, ‘Locked Down’, was a magnificent return to the Nite Tripper era. On this new recording, the setting is still very much New Orleans, but with a subtle twist. It is a homage to the music of one of the Crescent City’s finest sons, trumpeter Louis Armstrong. Both the vocal and instrumental side of the Armstrong canon of work is catered for and some major names in the jazz world to fulfil that task including trumpeters Terence Blanchard, Nicholas Payton (the ideal Armstrong foil on trumpet) and Arturo Sandoval while Bonnie Raitt contributes blues guitar and vocals. One of the most interesting cuts is a radical reworking of ‘What a wonderful world’, here taken at a different and higher tempo that suits the New Orleans state of mind and the Blind Boys of Alabama feature on background vocals. New Orleans musical institution the Dirty Dozen Brass Band contribute their noisy and brassy sound on a joyous ‘When you’re smiling the whole world smiles with you’ while Terence Blanchard enters the equation on a reworking of ‘Mack the Knife’, the Armstrong original of which is only marginally below the definitive version by Ella Fitzgerald. A more soulful side to Armstrong’s repertoire can be heard on the gospel-infused ‘Nobody knows the trouble I’ve seen’ with lead vocals from Ladini ably assisted by the McCrary Sisters and other traditional gospel number is covered on ‘Sometimes I feel like a motherless child’ with lead vocals by Anthony Hamilton. Blues are never far below the surface here and a duet with Bonnie Raitt on I’ve got the world on a string’ is effective as is ‘Gut bucket blues’ with Payton once again reproducing the Armstrong magic. If there is one minor gripe here, it is that the track listing gives a false impression of the album overall. It would have been preferable to have placed the jazzier material higher up the pecking order and phased in the more soulful material alternatively. 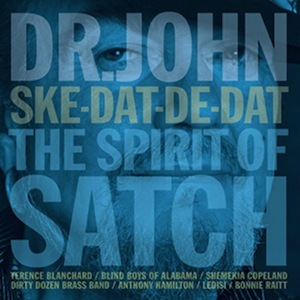 Otherwise, a terrific tribute in Dr. John’s own inimitable voice.